First off, it's my mother's birthday today, so HAPPY BIRTHDAY, MOM!!! I am feeling pretty pleased with myself because I managed to get her gift mailed in plenty of time this year...some years her birthday sneaks up on me. She's fun to shop for, because pretty much if I like something, I can bet she will, too. This year I got her some _____ and some _____. I really liked the _____ especially and might have bought some for myself, but there was only one available, darn it. (I can't write what I got her until I know she's opened them, and she might wait until dinner tonight for all I know) Anyway, I hope you have a great birthday, Mom! See what's in the bottom left cube? I don't know what's worse, that my possessions are becoming retro-cool, or that I still have them in the first place! 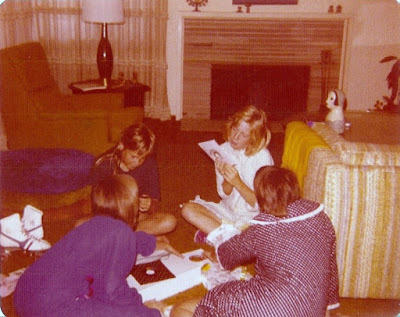 Me, my cousin Tara, friends Erin and Jenny examining the records. Seeing these titles makes a lot of sense as to why I know all the words and sing along to them whenever they are played on the 70s station on satellite radio in my car - which Jeff does not appreciate, by the way. He isn't impressed with my taste in music. I say he's missing out on some good tunes! Seriously, I was amazed that I managed to make my machine do this! I'm hoping that by taking this class, I'll be less intimidated by my machine and will actually start sewing with it. I made two pillows over a year ago and haven't touched it since, which is silly. I'll have to go peruse patterns and get some inspiration to sew something - I'm not sure what I'll choose to make, but you can bet it will include a buttonhole! I think my dog is the Kim Kardashian of pets - always needing to be in selfies! More on these socks soon - I have to run now. Have a great weekend! project bag for your knitting? I loved your socks such pretty colors and nice pattern! Me I have to get over my loathing of seaming or learn to make top down sweaters. I finished my hubbys sweater a while a go and I am poking along about seaming it up. I am down to knitting my last sleeve on my cardi then I will have to seam that too wish me luck. Oh and I am working on my first knitted baby blanket it goes up to 207 stiches on the needle currently on 190 before reductions start that is my knitting update. Have a great weekend! You know, the one thing I've actually made with my sewing machine is a project bag for my knitting! OK, that and two pillows. Woo! Happy birthday to your mom! I hope she enjoys the _____. That box reminds of the video game Q*bert. Whenever I see that pattern, that is what I think of. Child of the 80s, I guess. Jeff would be a goner if we both were in the car then because I know all the words to those songs too! That Target ad is fascinating. I wonder where they got their case? I wonder if they sell them? So many unanswered questions. I always wish I knew enough about sewing at least to be able to hem my slacks. Alas, I do not, therefore I pay anywhere from $10-$25 if I need something hemmed. How cool that you have the exact same case as the target ad! I need to take a sewing class myself. I have a few projects that need some sewn in liners and my sewing machine tension is so off and I just haven't figured out how to make it work just yet. I guess it is time to peruse youtube for some answers. Have a great weekend! Funny, I was looking at an adorable knitted baby cape in the gift shop where I volunteer, and the hood on it is lined. Still intimidates me to think about sewing on a knitted product, but I might need to replicate that cape and give it a try! I like your choice in 70's tunes! I need to find that 70's station. And your socks are gorgeous!! HEY! Sewing isn't just for old ladies!!! I'm a quilter you know. Hmmph. ... ... ... ... Wait a minute ...... Oh yeah, I AM old. My mother has a set of 45s from the 40s and early 50s. As a kid, I used to listen to those records for hours and still know all the words to those old songs. Knitting and sewing is hot again here in Holland. There was even a competition on TV last year who was the best sewer. When I was young I made a lot of my own clothes, I even followed a course when I started living in this town. It took 5 years and every year I had to make an exam and sew something for it. Right now I have no interest anymore in sewing or knitting but the love for cross stitching that I have been doing since I was around 13 never has gone away. Sometimes I do it more than other times. Ooo, I bet in no time we will be seeing all your fab sewing projects! Yay! That must have freaked you out to see YOUR record box in the sale flyer. ! LOL at Paco being a Kardashian. LOL!!! !